Table lamp in-line rocker switches, in-line rotary dimmer switches & round step on/step off foot or floor switches. We also have small push button switches with different coloured caps. You can Match your choice of lamp switches & plugs with our complimenting colour range of lighting flex. 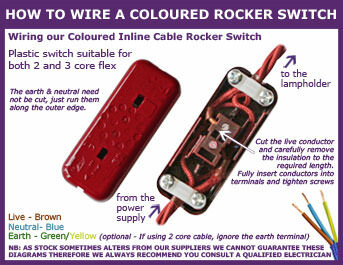 For wiring diagrams and certification of our products please see below. If you are not a qualified electrician you should always get any electrical work you do properly checked and certified. A selection of common questions are answered on our SWITCHES & SOCKETS FAQ's page (see link above).